« Let me be clear. 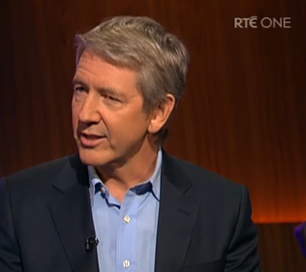 Last Friday, RTE’s Late Late Show invited Patrick Holford, a “pioneer in the area of health and nutrition” to talk to people about how to beat depression. It’s an interesting choice of expert because Patrick Holford has no academically recognised qualifications in the treatment of depression and has spent much of his career building up his health food and vitamin pill business. He has been the source of much controversy. Holford has claimed that AZT (a drugs cocktail used to combat AIDS) is less effective than Vitamin C and has been pulled up by the advertising standards authority in the UK for making unsubstantiated claims. In a nutshell, he isn’t the type of “expert” you want to be to rolling out when discussing something as serious and damaging as depression. Using RTE Player I went through some of the claims Holford makes during the interview, and as it happens, many of the claims check out. There are studies around that have shown a beneficial link between fish oils and depression. There are studies that show a positive correlation between Vitamin D and seasonal depression. There are studies that link mood to obesity. Holford conveniently ties these studies into a single thesis: that what we eat is the most significant link in causing and treating depression, when many decades of clinical research would present a very different view. In other words, it’s just a confident sales pitch: read my book, eat the foods I suggest and you will feel better. Maybe it will and maybe it won’t; such is the power of the placebo effect; but in reality it falls far short of a comprehensive solution to the problems of depression. Depression really is a grind. It differs from bad mood because it is not easy to get rid of and the depths of despair reached people inflicted by it. It can last for days, weeks, months, even years. No magic bullet has yet been found and it appears to differ greatly from person to person. There are lots of probable reasons and many treatments. It is one of the most widespread illnesses in society and is tipped to be the second leading cause of disability by 2020. Many of the most effective weapons against it (antidepressants, psychotherapy, electroconvulsive therapy) remain unpopular and stigmatised, often by the very same groups that promote healthy eating and mineral supplements. In the battle against depression what is most important are treatments that work, not ones we would like to work. We need a serious discussion about depression in this country, not just a sales pitch by a vitamin pill vendor. RTE seem to be missing a “reasonableness” indicator. If they bring on someone on the fringe or someone with claims that are outside current scientific or medical opinion then they must bring on someone at the same time who can balance and refute any daft statements. Most people watching these programs are rarely capable of correctly analysing these chancers who are well practiced in distorting the facts. The fact that RTE is a public funded body makes this essential in my opinion. We go to jail unless we pay the licence fee and then they subject us to this nonsense. The Late Late has never particularly been the bastion of intelligent and informed discussion about anything other than children’s toys at Christmas, but they appear to be aiming for new depths by promoting willfully ignorant pseudo-scientific opinion and attempting to pass it off as a “pioneer in the area of health and nutrition”. “Pioneer” is evidently the new code-word for “making it up as I go along”. I don’t mind opinions, I don’t mind new ideas. But I have a real problem with someone being given feted with puff-piece publicity when their claims have been comprehensively proven to be untrue. I agree with alot of what you said Colm and whilst I am extremely sceptical about alot of ‘alternative’ therapies, the merits of each one must be tested. Holfords interview was one dimensional with a huge over emphasis on nutrition as a key factor in treating same. Ridiculous. However, ask the question why st johns worth is prescription only in Ireland when it is freely available in Germany who have a long tradition of herbal and nutrition based therapies (as well as a large sophisticated population. The reason why? The dominance of the Irish pharmaceutical network. Pat, the French too have a long history of using Homeopathy; you can buy Homeopathic ‘flu “vaccine” in a pharmacy, (I know I’ve been offered it), and also Tarot card reading and that tells us………. The problem with St John’s Wort is not that it doesn’t work (like fish-oil); but that it does. It is similar to Prozac. As such it is not safe for people to self-medicate with it. It’s actually dangerous for non-medical unqualified people to prescribe it as they quite possibly have zero idea of its side-effects or potential dangerous combinations with other drugs. The fact that something is allowed by another country’s laws should not lull anyone into complacent acceptance of a supposed therapy. After all the UK government is still A-OK with funding useless homeopathy. The South African government to its shame once upon a time ridiculed AIDS treatments in favour of vitamins. Thanks very much for your offer of help. We are still a young group and there are many things we would like to do. I would be delighted to have a chat with you at the next meeting if you can make it. As someone who has had depression twice, and emerged from the black depths through a combination of time, prescription medication, changing to a more healthy diet and getting more exercise, more sleep and more sunshine, I have to say that while the last four factors certainly help me avoid slipping back into the depths, I really think that the only solution once you’re in a depression are the first two. In much the same way that washing your hands when you have a cut can prevent an infection, but once you’ve got gangrene you’re going to want antibiotics or face amputation. Thanks Woo. Nothing could be more heartbreaking than someone in the depths of despair refusing to take options that have been shown to be effective in lifting the cloud of depression. Hi Colm, great post. Just a quibble on your last comment. There are good reasons why some people living with depression refuse options. I’ve been on three different anti deps in the last three years and some of the side effects are brutal. I read in a peer reviewed medical paper that gardening can ease the symptoms and its worked for me, along with exercise. But I think the key is “for me”. Although the effect is produced by bacteria in the soil that gardeners inhale. I’ll prolly be on anti deps for the rest of my life and I hate the cheery “just do this and you’ll be all better” crowd who assume that I haven’t read up on all their “cures” and the science that debunks them. Fish oil is great for skin but it ain’t no magic bullet! Thanks Mór. You put it well. Maybe I should have better rephrased it as refusing options out of hand. I get the homeopathy thing and the theme been drawn out. It’s an unfair comparison and grania the dangerouness of unregulated st johns worth is not a big issue for developed countries. It was actually a pharmacist from Germany at doctoral level working in Ireland who discussed with me the Irish position and she thought it was ridiculous. We tend to not question the motives behind these decisions but accept them. I have a professional and personal interest in depression in depression and the medical advances in treating a host of mental health difficulties have been fantastic overall. I’d be concerned about the explosion in counselling courses and there are alot of dangerous ‘therapists’ out there. The whole thing can be a minefield and it’s very difficult when people invest financially and emotionally in dealing with depression as there is always a desired outcome. Need for more debate, thanks everyone..
Do I have a very discernible laptop or has this interview with Holdford been removed from the RTE player? I agree there is no silver bullet approach to curing depression, however nutrition and exercise are fundamental to both physical and mental health and it’s brilliant that an advocate like Holford is encouraging healthy lifestyle. I actually followed his healthy eating plan for a couple of months (genuinely) to try and reduce nicotine cravings and not only did I lose excess weight but I felt brilliant, had more energy … didn’t succeed in giving up the cigs but to be fair I stopped following the diet when I got mad busy. A lot of what Holford is saying might be common sense but if it helps people get more healthy and boost their mood – is that not brilliant?! Just to highlight – I am a total believer in prescription medicine too – but it really confuses me why people get so up in arms about Holford. Patrick Holford is a total charlatan and I’m hugely relieved that so many commentators take him with a pinch of salt. Emily – you make a hugely good point and I’m happy to respond to it. A lot of what he says does make sense, but there are other things that are frankly nonsense. Vitamin C being the best way to treat AIDS is one. Healthy eating is not enough he says – you must buy supplements and crucially, you must buy HIS supplements. It’s also very dangerous and insulting to people who suffer from depression to tell them that they should be able to get better without needing medication. The issue is – the only thing Holford has going for him is as you say common sense. Obviously common sense can’t be patented so he adds his own dangerously ignorant pseudo-science to make his brand unique, and frankly I believe no credence should be given to somebody who falsified his academic credentials as Holford did. I absolutely agree with you Emily – common sense helping people to get better and feel better is definitely brilliant. Common sense is a wonderful thing. But use your own common sense, you don’t need a fake scientist to provide you with nutritition advice. This is deadly serious – many people around the world give up on retroviral drugs for HIV or chemotherapy for cancer to take food supplements, and regardless of the benefits of a healthy diet it is NOT a substitute for necessary medication. As regards St John’s wort – it is still a drug, merely one that happened to develop naturally instead of by scientists. It does have side effects – Pat Kelleher, whoever told you it is harmless has misled you. It can interact with other drugs – notably negating the effects of the oral contraceptive pill – and in some cases this can have life-threatening consequences. It causes similar (though usually less severe) side-effects to most SSRI anti-depressants. It can even cause psychosis if used in the case of schizophrenia, and with self-diagnosis it is not difficult to see that this may happen. It is available without prescription in Germany, but I understand that pharmacists take a more active role there and would advise purchasers on the associated problems. Thanks Anne for the response – I accept all your points and to be fair I did buy holford’s vitamins etc. as part of my give up smoking diet. I appreciate you coming back as I was strongly considering inviting holford to speak at a national conference on depression as I think there should be a lot more focus on healthy living, not in place of medicine but I feel a lot of the obvious healthy living points are taken for granted. Since posting here I have researched Patrick holford and have found similar points to those you make above … In particular that it’s all about selling his products and his ‘science’ is not properly researched. On that note – can you or anyone recommend a good high-profile spokesperson on health/ nutrition that would be inspiring/ beneficial as one of a number of speakers at a conference in depression. They don’t need to have a Series of qualifications but need to be trustworthy with a track record. The other speakers will be medical professionals… Psychiatrists, gp’s, medical researchers. I am looking to highlight nutrition/ sport/ family/ friends/ work/lifestyle elements too that are essential elements in positive mental health. Hi Emily, can I just say I’m really impressed by your approach. I think it’s so important to have a holistic attitude to mental health, and lots of the practitioners I admire most are strong advocates of diet, exercise and meditation/mindfulness and similar. I think Paula Mee is worth a look as a speaker for your conference, she’s a dietician, former nutrition manager for Superquinn and also has a TV show Health Squad. She’s interested in mental health, not specifically depression as far as I know but she could still be an interesting person to hear from.